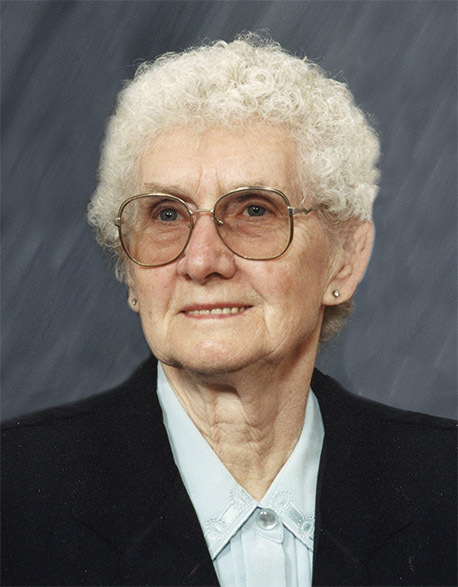 Peacefully, on Sunday, April 14, 2019, our Mom, Elisabeth 'Betty' (Friesen) Wall passed away. She was 93 years old. Betty is predeceased by parents, Heinrich and Elizabeth Friesen, her husband Ben, her five sisters and one brother. Sisters - Margaretha Friesen, Katharina (Tina) Hiebert, Anna (Anne) Goertzen, Helena (Helen) Loewen and brother Heinrich. Betty is survived by her children – son Ben (married to Rosemarie), daughter Gloria and son Dean (married to Sara). Her grandchildren - granddaughter Angela Storey (Spouse James), grandson Joseph, grandson James and his partner Aliesha, grandson David (Spouse Kayla), granddaughter Kathryn and granddaughter Devon. Mom was also blessed with four great grandchildren – Sara, Jacob (parents Angela and James), Madalyn and Charlotte (parents David and Kayla). Betty was born Feb 15, 1926 in Swift Current, SK area to Heinrich and Elizabeth Friesen. She was born same day as her identical twin sister Anna, also known as Anne. It is believed, that Anne was the older twin but only by one minute. Betty and Ben were married on June 15, 1952. Prior to marriage, both were baptized in the Sommerfelder church. They became longtime residents of Plum Coulee. Although Betty was a full time home maker, she was also involved in the local community in Plum Coulee. Betty's community activities included sewing instructor in 4-H in the 1960's and into the 70's. After the opening of the New Horizon Drop in Center, she served on the Board and also served in the coffee shop. For years she was involved with the Women's Institute and was the last president at the time of the closing down of the W.I. organization. Betty was a very talented sewer, knitter, baker and cook. We, as a family, benefited from many a repair job on clothes, new blankets made, beautiful hand knitted sweaters and delicious food. Her freezer was always full of pies, kielke, wareneki, buns, and her pantry with jams and soups. Her komst borscht, green bean soup and cabbage borscht was amazing. After Dad passed, Betty lived in the house on Russell St. in Plum Coulee for a few more years. Betty later moved into the Maple Manor in Plum Coulee. She lived across the hall from a good friend Betty Janzen, so the two ladies often had their apartment doors open to each other so they could talk to each other while they were still in their own places. We, would like to as a family, acknowledge Elle Penner and her husband Walter. After Dad passed away, during the time they lived in Plum Coulee, they were good friends to Betty and took her to many a doctor appointment and helped in many ways we will never know. As Mom aged, it became evident she needed additional help due to her dermentia. Betty moved from the Maple Manor in Plum Coulee to The Apartments, formerly known as the Ebenezer, in Altona. She became a knipsprat shark. If you don't know what knipsprat is, it also known as crokino. She won many a prize when she played. Betty, also loved doing word find puzzles, and had several huge puzzles books in her place. Unfortunately, her dementia continued to progress. It became evident again, that Mom needed more care than what available at the Apartments and through Home Care. Betty moved into Eastview. She lived in the Rosewood area, then Blue Ridge and finally in the Evergreen branch. As her family, we also say Thank you to the Eastview staff. Their care, love and treating her with the respect and dignity she deserved was amazing. Mom provided many laughs for the staff with her sense of humor and I know they will miss her also. They have been awesome throughout it all. It’s not easy saying good bye to someone who has been a part of your life. Mom will be missed by all her family and friends. We will miss her but we are left with great memories of her. She will be in our hearts forever. Funeral service will be held on Saturday, April 20, 2019 at 2:00 p.m. at the Plum Coulee Sommerfeld Mennonite Church with burial at the Plum Coulee Cemetery. Viewing will be at Wiebe Funeral Home Altona on Friday, April 19, 2019 from 9:00 am to 9:00 p.m. and at the church prior to the service.